The first step involves testing the network for its suitability for Voice over IP (see our VoIP-Readiness-Analysis). This ensures that the network can guarantee reliable operation with higher traffic as well as the requirements for Real Time Communication (RTC) necessary for IP telephony. Next, the VoIP system, consisting of one or more servers, will be installed and configured. Afterwards, users and administrators may start testing the new IP telephones. VoIP gateways are used to route incoming and outgoing calls, and allow for key users to be included in the test phase. After the test phase, users can be migrated from the existing telecommunications system to the new VoIP PBX. A defined prefix can then be used to route calls to users registered on the new system. Incoming calls are then routed automatically to the correct user, whether registered on the telecommunications system, or the VoIP server. Should a user from the telecommunications system wish to reach a user registered on the VoIP system, they simply dial a prefix before dialing the extension. This way, all participants are always available. Lastly, as soon as all users have been migrated, the telecommunications system can be disconnected. Administrators have a direct influence on the time plan as well as the finances. 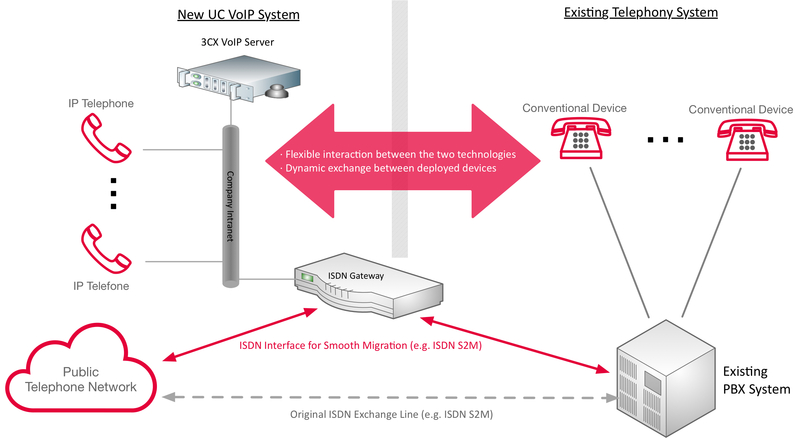 Smooth Migration allows you to decide which components will be moved when to the VoIP system. For example, components, such as analog devices, that require a gateway in order to communicate via VoIP can simply be moved at a later time. Risks involving your availability are minimized. Particularly when compared against migration on one set date. Through the inclusion of users in the test phase, the acceptance of the new technology is high. Smooth migration allows for a stress free switch to VoIP, even for large enterprises!